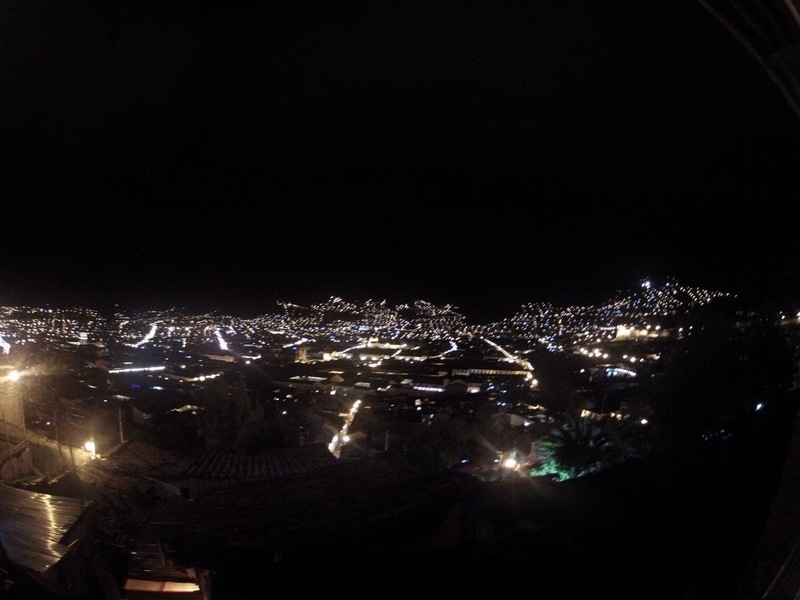 The good, the bad… Cuzco | Blog the world!!! “I can say thank you in Spanish.” He looked disappointed. He also looked like ‘thank you’ and ‘Spanish’ might have been the only words he understood from my reply. He passed me the drinks I’d previously managed to order. “Gracias” I beamed proudly but the man didn’t look impressed. Clearly me and Gemma were going to have to try harder than this in South America. This conversation happened in Lima. We’ve now made it to Cuzco but it’s not been easy – we didn’t understand the lady at the bus station, we couldn’t tell the taxi driver where we wanted to go and this morning ordering breakfast was a nightmare. We couldn’t even understand our taxi drivers extensive Spanish tour of the city which he took it upon himself to deliver. Still, it’s nice that he tried. Cuzco is an old Inca city built at 3,200 meters above sea level in the Andes. To acclimatise you’re advised to stay in the city for at least four days before you start trekking. We came here to do the classic Inca Trail, and boy are we glad we gave ourselves time, not only to acclimatise but also to enjoy the beautiful city itself. We visited the chocolate museum and learnt how to make our own chocolate, we visited the coca museum and learnt how to make our own cocaine (I kid you not) and we strolled around several of Cuzco’s many markets. They were all more than deserving of a visit if you find yourself that far up the right mountain, but simply wandering aimlessly around the city itself is more than rewarding. The old stone formations that fit like a jigsaw which could only be Inca design, the plazas with their different and interesting statues in the middle and the winding cobbled side streets make Cuzco the perfect place to wait in limbo before a big trek. Both Gemma and I discussed how it reminded us of the more beautiful areas of Scotland, the main difference being the green hill that towers over the city which reads ‘Viva La Peru’. I don’t know how it reads that, but I assume its someone’s job to mow the letters into it each week. “What’s the point of being in Cuzco?” Gemma sulked holding her stomach “it’s the same as stupid Scotland except it hurts more”. She’d been up all night with a temperature and the onset of altitude sickness – the romantacism of the city had worn off. And so began two days for Gemma stuck in the bedroom. Luckily our room had a panaramic view of the whole city so it’s beauty couldn’t be completely ignored, but Gemma had all the symptoms of altitude sickness and all quite bad. I won’t go into them as its quite gross and she probably won’t want me to but I assure you, it was a sight. I was affected too, but to a lesser extent. I’d run out to the shop to buy ingredients to cook with and by the time I’d be back I’d be so out of breath I’d have to lie down in reception for ten minutes before I could make the final steps to the kitchen. The people in reception were all incredibly attentive each time I managed to venture downstairs always asking me how Gemma was… in Spanish. They made her coca tea and probably wished her several nice thoughts. It was hard to tell though. Other than from one guy, they were all in Spanish. Luckily Gemma made her recovery about 7 hours before we started the trek. We made it to the 4am starting point but we were fragile, along with, it turned out several others in our group who had also been suffering. So now we’ve returned from the trek (which is deserving of a blog itself) and we’re back here in Cuzco. We’re tired and we’re both still feeling a little ill but we’ve conquered the Inca Trail. Since the trek we’ve realised there’s something different about the language barrier here. When we’ve not been able to communicate with people, instead of walking off as many would do, people here persevere. They speak slower, or they simply smile and indulge us in un-understood conversation. The taxi driver happily told us all about the city he’s proud to live in, the hostal staff continued to enquire after Gemma even though they knew I didn’t understand them, and people on the street… Well it’s hard to know what they’re saying but they still keep saying it. People here want to talk to us, and we want to talk to them. To overcome this we’ve booked a week of Spanish lessons in our next stop of Arequipa. I just wish we could come back here to show everyone afterwards! It hasn’t taken long since we’ve been back in Cuzco to realise that we were right on our first day. Just walking back to the hostal we passed those quaint cobbled side streets and passers by stopped to say ‘hola’. When you succumb to altitude sickness it can be hard to remember that Cuzco really is a beautiful city. It’s just built in a really stupid place.